Our Product Matrix shipping extension gives you the maximum flexibility to make your shipping rates work for your business. Product Matrix enables you to define your rates according to any combination of destination, product, price, quantity, weight and customer group rules. 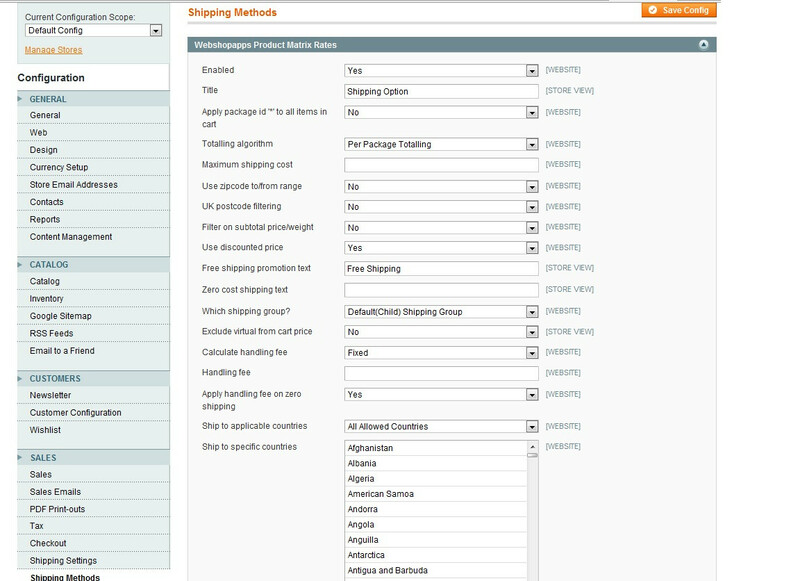 You can also create 'shipping groups' to categorize your products and define shipping rates. For example, you could assign one rate for books, another for CDs and yet another for DVDs. Keep things simple, or customize your shipping rates right down to the individual product level. 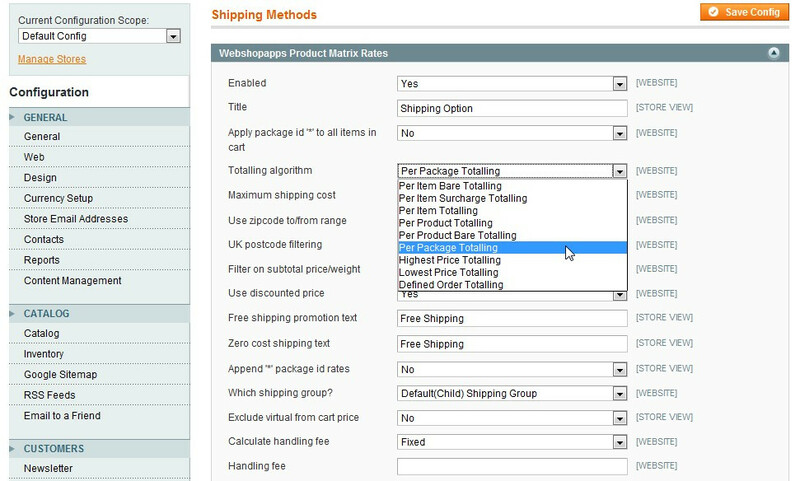 With Product Matrix you can tailor your shipping rules to suit your unique product set and customer base. 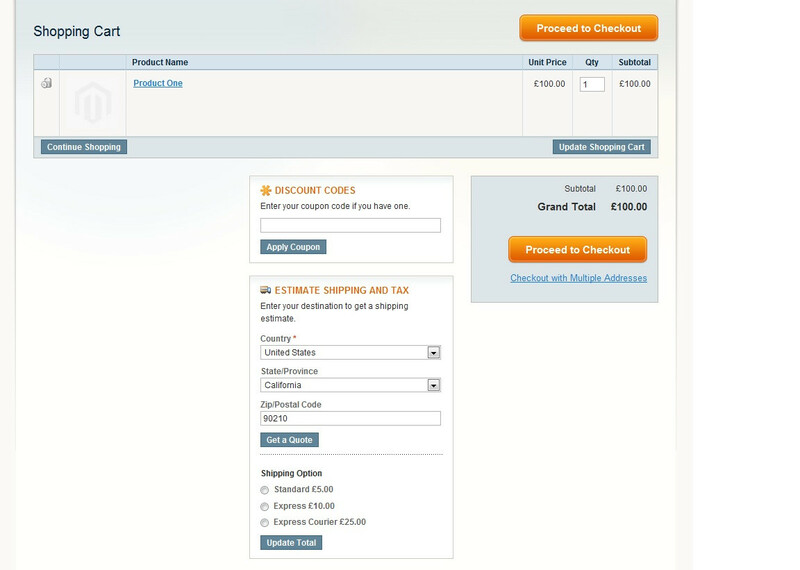 This is our most popular custom rates extension – used in Magento stores worldwide. Please note that PHP 7 is supported with version 20.0 onwards (released 3rd October 2018). 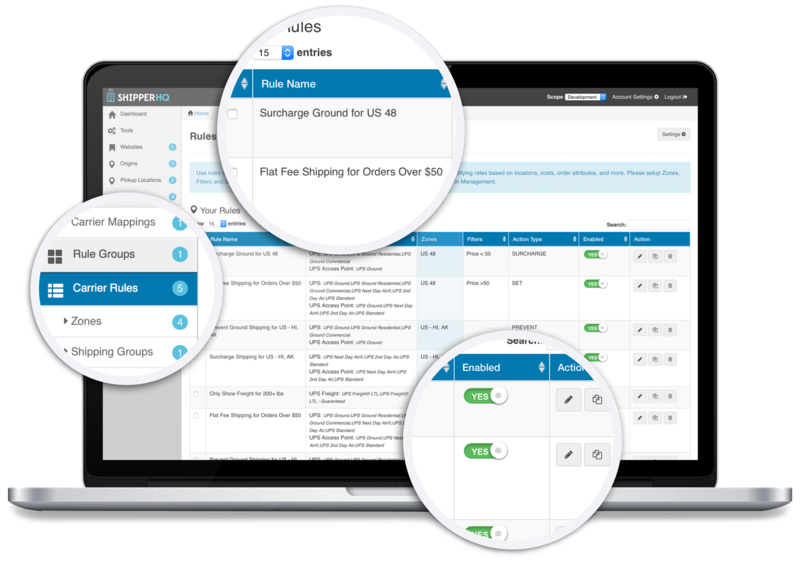 ShipperHQ embodies the same functionality from Product Matrix, giving you the ability to get advanced custom rates based on product attribute, weight, price, quantity, destination, and customer group. We have combined this with functionality from more than 40 of our most popular WebShopApps extensions to give you full control of the shipping in your cart within one easy-to-use dashboard. Play with a live demonstration of Product Matrix. Mit Product Matrix kein Problem und schnell umgesetzt. Bei Fragen hatten wir sofort eine Antwort von Karen im Postfach - nicht nur mit irgendwelchen allgemeinen Hinweisen, sondern mit der Lösung UND und der korrigierten Tabelle!! 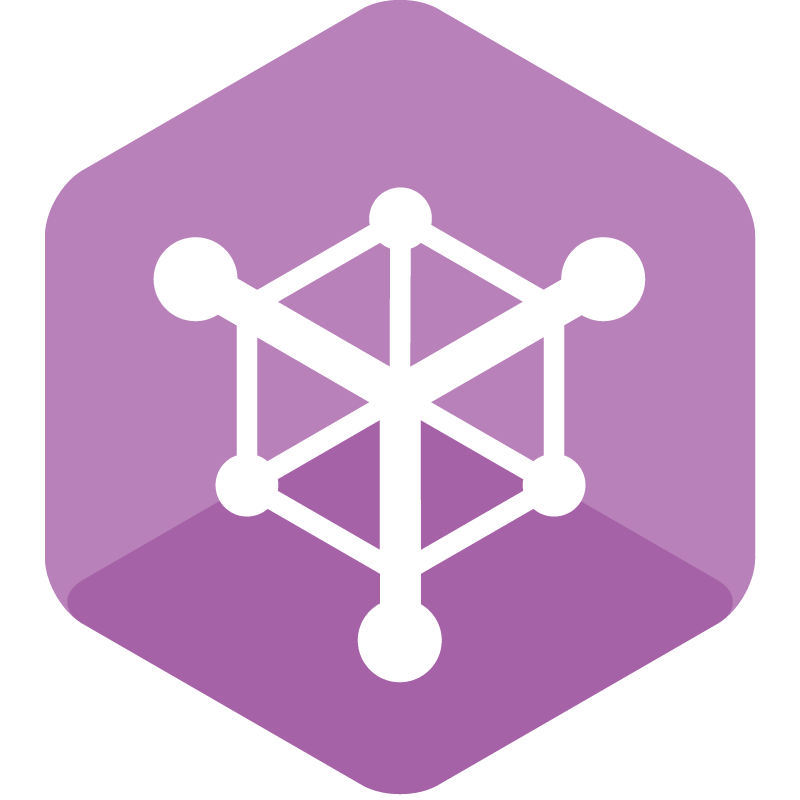 The WebShopApps Product Matrix Shipping extension was recommended to us by the developer of our Magento eCommerce website. We purchased the extension, read through all the documentation and had a good go at creating our shipping table. After a bit of trial and error we got this working with our six shipping groups, which included offering a free standard shipping on all our products to the UK mainland. However some of our items are really long and do not weigh that much, for these items only select carriers would take the items and charged a lot to deliver them to non UK mainland locations. For these items we couldn't really offer a free service to people outside the UK mainland. This is where it got a bit complicated, when we changed one thing in the shipping table it ended up doing the same for the UK mainland, which was not our desired result. However this is where WebShopApps were really great. Jason from WebShopApps helped us get everything working exactly how we wanted it to. After many email's backwards and forwards our shipping table works exactly as intended. We're very happy that we can offer free shipping to anywhere in the UK mainland, then offer the customer a choice of upgrading to first class or even an express carrier service. Then as products get too heavy / large when multiple products are in the basket, exclude the shipping methods that would not accommodate the items in the basket. Finally we can offer free Royal Mail delivery to places like the Channel Islands for smaller items, then only charge when we have to for really long items, ensuring all our customers get the most fair / competitive shipping prices possible. This Magento extension is very powerful and most importantly has the support to really help you configure it exactly how it needs to work. I'd be very happy to recommend WebShopApps, in addition to having really powerful extensions, the support offered by them is fantastic. A big thanks once again Jason, all the help / support over the last couple of weeks has been really appreciated! I have been using this for several months and recommend to you if you want automate label production by weight, location, customer group. Ours is connected to Metapack and as made the whole process so much smoother, saved us money and time in ensuring the packages we send are on the most cost effective service whilst meeting the customer agreed timing for delivery. It was a bit complicated to set up at the start, but I got all the help and support I needed from the team at webshop aps. So, over the weekend I bought Premium Matrix Rates. I played with it, but it turned out that it did not have the functionality that I required - what I had really needed all along was Product Matrix - my fault for not reading carefully enough. A quick call to Web Shop Apps and they sorted out my error. Being thick, I required hand-holding to get the extension to calculate the shipping that my client required. After some calls, Josh had worked out what I needed to do and explained it all to me. He sent over a completed .csv file and a modified version of the extension with an extra variable that my situation required. You honestly can't ask for more than that. I will use their service again like a shot and the UK based office hours suits me down to the ground. Shipping is a big deal in eCommerce and our business has some very demanding requirements, of which this app is perfect. The support from the folks was prompt and predictable. The owners of our business posed a challenge when defining how we would manage shipping in a new online store we were building. The ProductMatrix shipping module not only gave us this solution, but offered us room to refine our shipping solution as we grow. A great module that I would highly recommend to any serious online retailer. I don't write a lot of reviews, but I felt that the Webshopapps team deserved this exception. This extension is so fully featured that it covers every possible shipping scenario that I could imagine for our store. 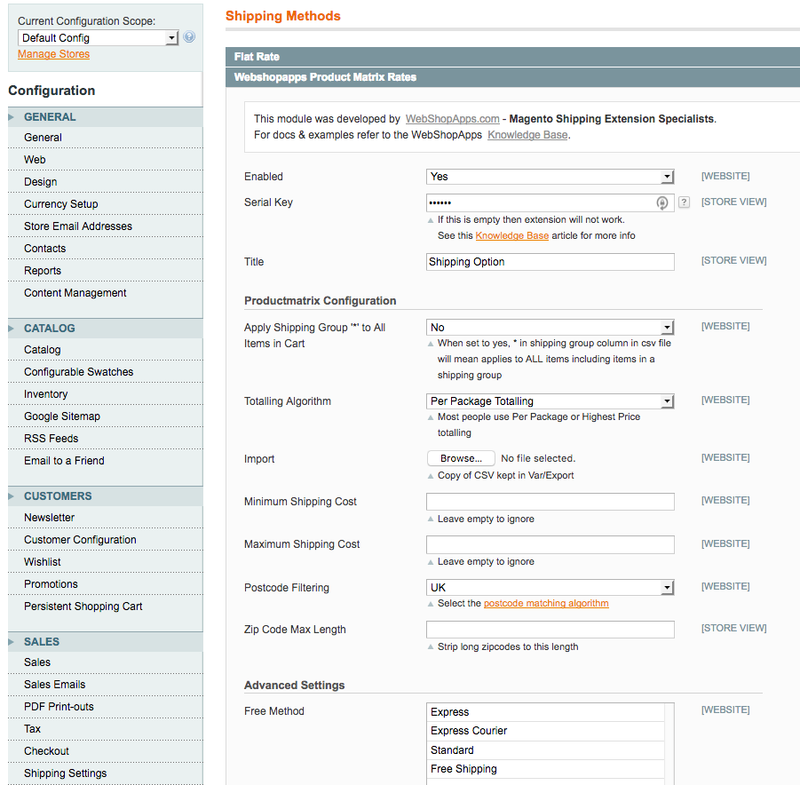 Amazing that this sort of capability is not built into Magento out of the box. 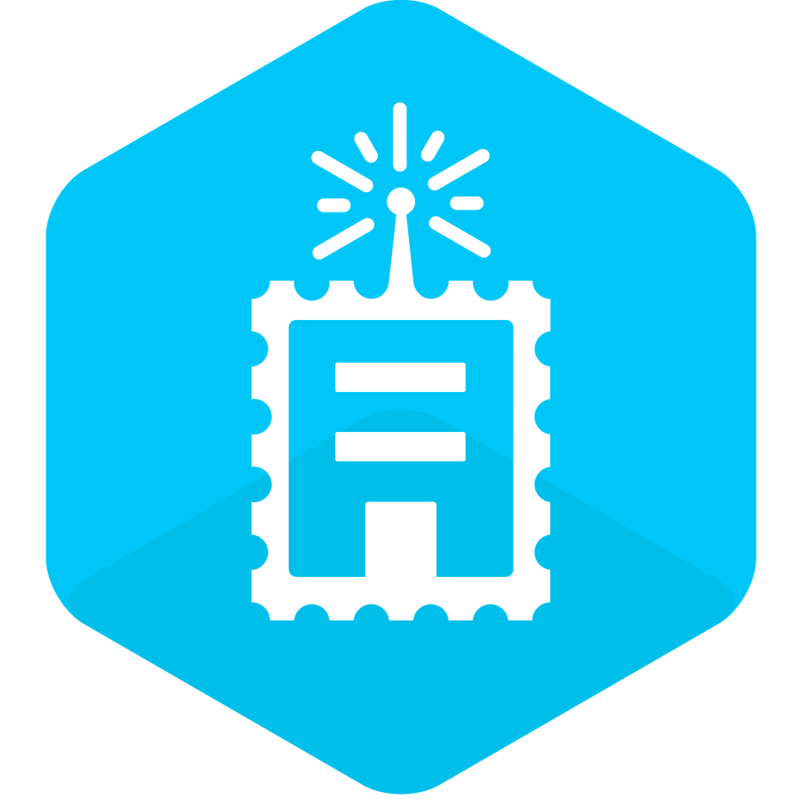 The support for this extension has been above and beyond any sort of software support I have ever received, and because of it these guys have my business for life. Thank you Karen and the rest of the team for helping me with the extension over the past year. The product and support are absolutely first class. Do yourself a favor and buy this extension for your shipping needs. Very helpful video to understand how it works. Quick reply for any trouble concerning install. This extension is just great. It calculates our different shipping methods, considering price and weight limts of several product gropus. Despite the language barrier, the support is great as well in terms of quality and speed of response. Special thanks to Josh who helped me to set up the CSV and corrected some attributes in our system too. The flexibility of this product is really amazing - I'm now confident I can adjust my shipping rates to whatever I could possibly need in the future. And the promise of great support and backup is absolutely true. I'm totally new to all things Magento and webdesign and was helped at every step of the way. Really great product and team! So I spent a lot of money getting my Magneto site up and running, only to realize, way too late in the process, that the shipping was going to be a major issue. I have many different products on my site with different weights and sizes and unfortunately Magento had no way of allowing me to imput the L x W x H of my packages, only the weight. That meant that I would not be able to get accurate shipping rates. I spent countless hours trying to come up with a solution and my developers were not much help. I found this extension and it was exactly what I needed. 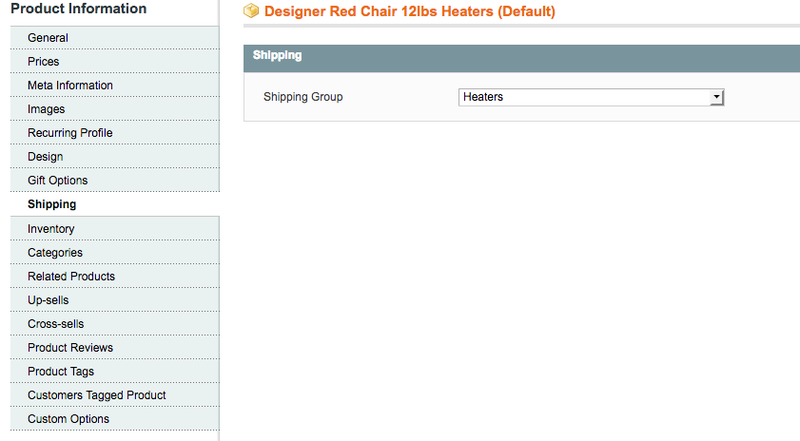 I could assign different shipping rates to different categories. I was shocked that this was the only extension that I could find that dealt with this problem. I bought the extension and it was the perfect solution. To top it off, Karen spent the time to help me get it installed. I have no web development experience and she never lost patience with me. A+ for this extension and the service as well. Easy to work with, easy to configure. The support team is great, they walked me thru setting up my csv file and enable the shipping option in the checkout process. I emailed them my shipping scenarios, and they found me the right extension and even helped me configure it. 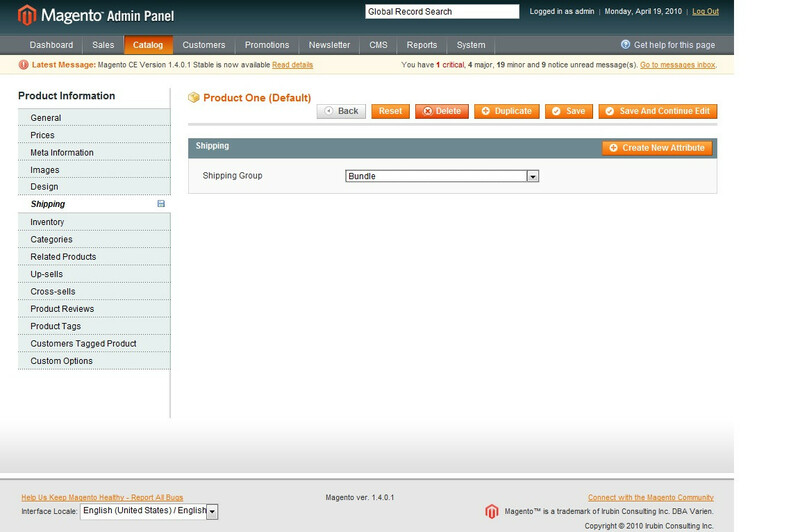 Without this magento extension we would not be able to have a shopping cart. This is a must have for anyone using magento with more than one shipping provider using multiple table rates with multiple carriers. Very Easy to install and to adjust. To manage Groups or Product gives thousands of possibilities. Thanks for that helpful utility! Great extension for every Magento based website. Everything works as expected and the support is stunning fast. I needed an additional feature and it was implemented within some hours. Great! Wir verwenden Product Matrix in einem Onlineshop eines groÃŸen deutschen Museums. Unsere Fragestellung: Eintrittskarten sollten einen pauschal Versandpreis haben - egal wieviel StÃ¼ck der Kunde kauft, die BÃ¼cher und Merchandiseartikel sollten nach verschiedenen Gewichtsstufen kalkuliert werden. Mit Product Matrix kein Problem und schnell umgesetzt. Bei Fragen hatten wir sofort eine Antwort von Karen im Postfach - nicht nur mit irgendwelchen allgemeinen Hinweisen, sondern mit der LÃ¶sung UND und der korrigierten Tabelle!! Hut ab, toller Support, danke Karen auch im Namen unseres Kunden! Super extension with a lot of options. Had some trouble setting it up, but support is great and helped me on the fly. Every option we where looking for is fixed/setup! This extension is hugely flexible and has helped us completely fulfil with our complex delivery rules. Our site needed to offer standard courier options for non-fresh items nationwide, and a named day delivery option for fresh items, but only within certain regions. Both needed to have free delivery thresholds and deal with prioritising the delivery options available if both fresh & non-fresh items were ordered at the same time to an area where fresh delivery is possible. With a list of 50 postcode regions, each with different delivery day combinations available, 3500 SKUs and different product combinations the task was daunting and way way beyond what other delivery modules looked like they could handle. Having downloaded and installed the extension Karen was excellent in assisting us set up our configuration files, and even made an amendment to the extension for our specific needs. The extension itself is only surpassed by the levels of support which are brilliant, and I have no hesitation recommending it to anyone in need of a solution to a complicated delivery setup. We needed to charge different shipping rates to certain customer groups. We installed v0.4 on our instance of Magento and, apart from a minor bug that Karen resolved quickly for us, everything is working swimmingly. Its a really great extension. 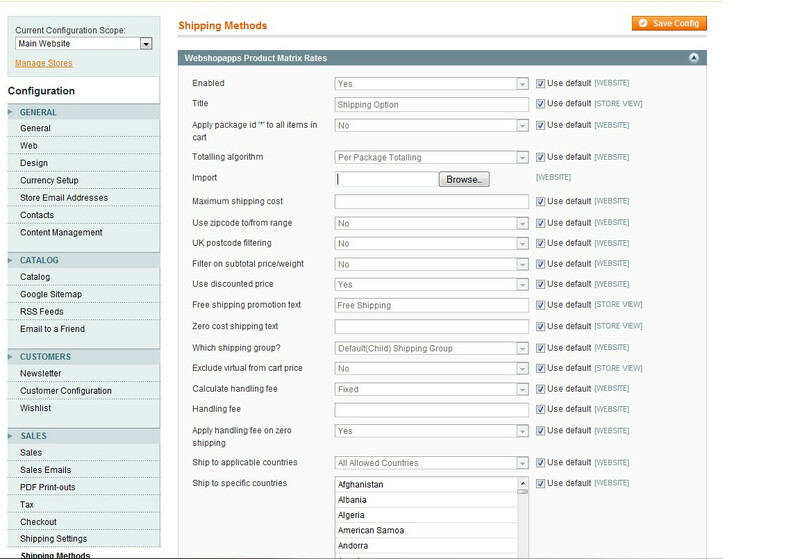 You can realise each shipping method you want easy done by defined in a simple csv file. The possibilties are awesome! And support is also great. I've get answer within a very short period of time! This extension affords great flexibility on delivery costs! We have a store with products delivered from many different wholesalers, with very different products and associated shipping costs. 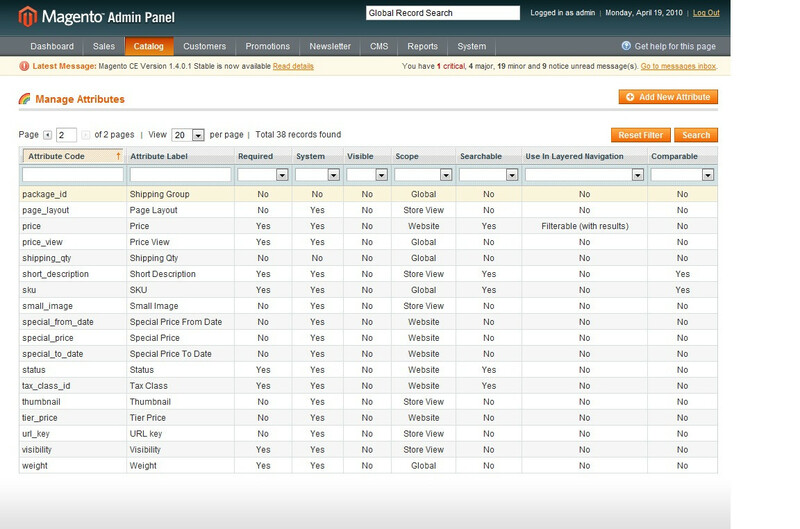 This extension allows us to configure different bands for different product categories and different criteria. If your shipping is as complicated as ours, this extension is a must. And the support we've had has been great - quick responses with easy to follow instructions. Top marks! I had a question regarding the exact details of a specific shipping scenario. Not only was my question answered but I was sent an import file to cover exactly my setup. After using the module for my current shipping I came up with an addtional scenario that would fit a common request from some of my customers. Again, an import file was sent and the instructions how to upgrade to the newest version were included. Both versions worked right out of the box no problems and easy to install.